The Golden Triangle, often called Civic Center as well, is a dynamic neighborhood with a splendid mix of old classics and new innovations. 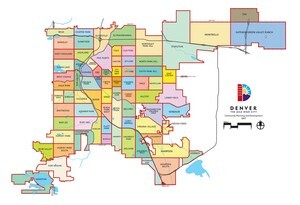 One of the oldest neighborhoods in Denver, this area's single-family homes were originally built in the late 1800's and early 1900's in classic Victorian style. Many historic homes and buildings can still be found here, even as the area continues to undergo a modern metamorphosis. New condominiums and lofts in a variety of styles from neo-historic French to modern contemporary have sprung up in this conveniently located area. The new construction allows more residents to enjoy this wonderful cultural hub. Condos and lofts in the area are as varied as the architectural styles from marvelous flats to luxury penthouses. The Golden Triangle today is home to interesting galleries, unique shopping, delicious restaurants and office spaces. Many of these have been converted from some of the area's original architecture. The central library branch, Civic Center Park, Denver Art Museum and Curious Theatre Company can all be found in this delightful neighborhood. With so many styles and attractions, Golden Triangle is aptly named. This shining city center is guaranteed to hold treasure for each resident who calls it home.